Properties in Poponi Beach average 4.8 out of 5 stars. Upstairs One Bedroom Apartment- with beautiful waterfront views! Property 1: Upstairs One Bedroom Apartment- with beautiful waterfront views! Romantic Cottage directly on private Double Bay Beach, Bahamas, "Senza Nome"
Property 5: Romantic Cottage directly on private Double Bay Beach, Bahamas, "Senza Nome"
"The PERFECT Caribbean Paradise" WIFI, AIR CONDITION. Property 14: "The PERFECT Caribbean Paradise" WIFI, AIR CONDITION. Trade Winds House - Oceanview, Private Pool, Short Walk To Pink Sand Beach, New. 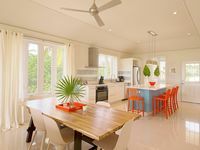 Property 20: Trade Winds House - Oceanview, Private Pool, Short Walk To Pink Sand Beach, New. Complete studio unit directly on Pink Sand DOUBLE BAY beach! "Senza Nome"
Property 23: Complete studio unit directly on Pink Sand DOUBLE BAY beach! "Senza Nome"
Romantic, luxurious cottage with stylish comtemporary decors, ocean views. Property 28: Romantic, luxurious cottage with stylish comtemporary decors, ocean views. Pool, Ocean and the best beach on the island....Paradise found! Property 31: Pool, Ocean and the best beach on the island....Paradise found! 2BR, 2BA Apt Suite: Spacious & modern w/ wonderful Bay views! Property 45: 2BR, 2BA Apt Suite: Spacious & modern w/ wonderful Bay views! We loved staying at the Governor&rsquo;s Harbour Apartment. It was very tastefully decorated, very clean and has everything you could need on a holiday. They gave great directions for nice beaches and restaurants in the area. We really enjoyed going to the Friday night Fish Fry which is only a few minutes walk from the property, which is great after a few Rum Bubas! Fantastic views to sit and watch when relaxing at the apartment. Lots of entertainment on TV and Netflix etc when you&rsquo;re exhausted from a day at the beach. Dom and Joy are great hosts who would do anything to make our stay easy. Highly recommend staying here and would stay again. My family and good friends recently stayed at Sea Esta. Our expectations were exceeded. The house is amazing and has all of the amenities needed for a relaxing vacation. Gerry and Pat were wonderful to work with and are extremely responsive. We spent a lot of time outside on the deck. You must go to Island Farms on Tuesday and Friday for the homemade bread! There are many beaches close by to choose from. Definitely take a day to go to Lighthouse Beach. You won&rsquo;t be disappointed! Thank you, Gerry &amp; Pat, for sharing your beautiful home with us. We will definitely be back! !